Maximize Your Summer With a Hardscape! There’s nothing like sitting outside, enjoying everything that summer has to offer. Summer is that special time of the year when sitting inside feels like a waste of time. If you are looking for a great way to maximize the time that you spend in your yard then you have come to the right place! At Dynamic Landscaping and Irrigation, we are proud to be a different kind of landscaping company. We can do so much more than just arranging your flowers or mowing your lawn, we can design and build incredible hardscapes that will allow you to enjoy your summer like never before. We offer a wide variety of hardscapes, and we can build anything from a gazebo to an outdoor kitchen efficiently and affordably. With so many options available, choosing the right one of your yard can seem like a daunting task, but once you determine how you want to use your outdoor space, it’ll make it so much easier! Do you hate cooking inside during the summer because you feel like it heats up your whole house? 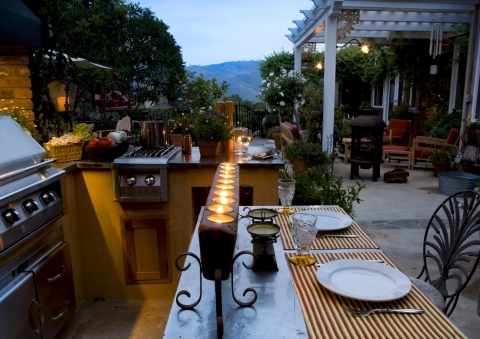 You can do so much more in the summer than just grilling when you have an outdoor kitchen! Would you love to swim without all of the crowds at the public pool? Cool off in the privacy of your own pool! Do you dream of roasting marsh mellows and sitting around a warm fire with your family on those cool summer nights? A fire pit is a great addition to any yard. No matter which hardscape you choose, you can rest assured that it will help you to maximize your summer! Contact us today to get started.